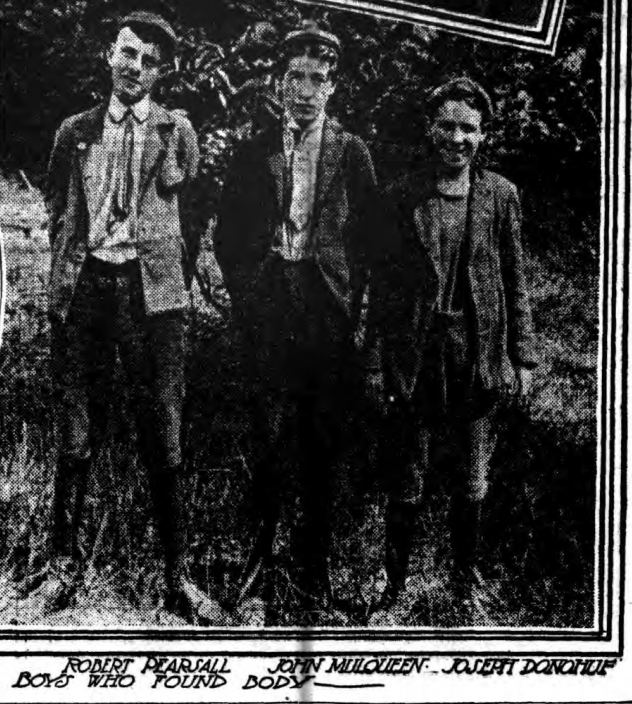 Two of the boys, Joseph Donahue and John Mulqueen, were neighbors, at Nos. 346 and 321 (respectively) 74th Street, down the street from the old OLA church, decades before the present church was constructed and the institution would come to occupy almost an entire city block. 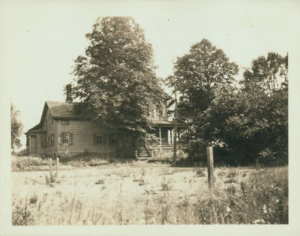 They brought two friends from outside the neighborhood to the foot of about 73rd Street, which until recently had been on the edge of the last Shore Road-facing farm; it had been cut up into lots for homes and sold at auction just the year before. The boys selected this place to swim because they had no bathing suits and it was the only place where they could not be seen…The boys undressed in the thick growth of bushes and then went down to the water. On the way down to the water, which at that place is 100 feet from the Shore Road, John Mulqueen saw a sack which he took to be a sack of potatoes. He called his companions and they decided some one had hidden the potatoes there. Being of an investigative turn of mind, Mulqueen went for his pocket knife and cut the bag open. Inside he found another sack. He slit this open and saw the bare skin of a human body. “It’s a dead man!” he screamed. The boys grabbed their clothes and ran, dressing when they’d put some distance between themselves and the sack. Mulqueen suggested two boys stay with the dead man while the others fetched help from the police station, at 86th Street and Fifth. But no one wanted to be left alone with the body, so all four sprinted, dripping and disheveled, the mile and a half to the precinct. “They ran into the Fort Hamilton Station out of breath and told Sergeant Hughes that they had found a dead man sewed up in a sack,” the Eagle reported. The sergeant could hardly believe them, but a patrol wagon was brought around the boys directed three officers to the spot where the sack was found. When the police saw that it was really the body of a man, they carried a stretcher from the wagon and placed the sack upon it. Then they had a hard struggle moving their load up the steep embankment…It took several policemen a half hour to carry the body from where it was found on the high embankment overlooking the bay up to the patrol wagon on the Shore road…They made an examination and concluded that the body must have been brought to the place in a wagon and then rolled down the hill toward the water. It had lodged against a clump of bushes seventy feet from the road. In the neighborhood the policemen learned that Catania was a peacefully disposed man, who tried to do the best for his family. There had been trouble enough in his household, for four months ago Catania’s oldest daughter…died and the people in the house had been mourning ever since. Catania always stayed at home nights. He never neglected his business and the dull gas jets in the shop window were kept burning long after the other shopkeepers in the neighborhood had shut up their stores and gone to bed. 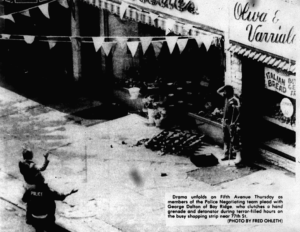 Catania’s chief delight was to sit on the doorstep of his place and chat with his customers, his children and the neighbors. His family last saw him Tuesday morning, at 20 minutes to noon. A friend had recently expedited a case of Italian tomato paste through customs for Catania, and he planned to pay the friend for the service. Catania put on his best clothes for the trip to Manhattan. But his wife thought he left the store with just $3 in his pocket, and would have planned first to collect money owed to him by an “agile, muscular” local named Vincenzo Trica (also called “Troyia”), who owed him $14, about which the two men had recently quarreled. Catania was last seen Tuesday, walking down the now-demapped Sedgwick Street to the ferry. Police at the Fort Hamilton station opened the sack. Pages of the Sunday New York Times from July 13, almost two weeks earlier, covered in blood, had been stuffed around Catania’s head. Moving them aside, police discovered his head had almost been cut off—it was “hanging by a single tendon in the back of the neck,” the Eagle reported. “Blood was still oozing from the cut.” The wound was still fresh, no older than a day. There were thirty-four inches of thin manilla rope, almost a cord, around the remains of the neck…. [It] ran down the back of the body and was tied to the ankles, which were drawn up toward the small of the back…There were two additional jabs of a sharp knife, one on the left side of the chin, two inches long and one inch wide, “egg-shaped” as the [coroner] put it in his report. There was another cut right below that, one-half inch long and one-half inch deep. The spinal column had been severed. He was missing his left thumb and forefinger, but these were old injuries. He was also naked. Police searched Shore Road by lanternlight and found a second sack, twenty feet away from where the first had been, this one packed with clothes “that had been slashed to ribbons,” covered in blood and presumably cut off Catania’s body after he’d been killed. 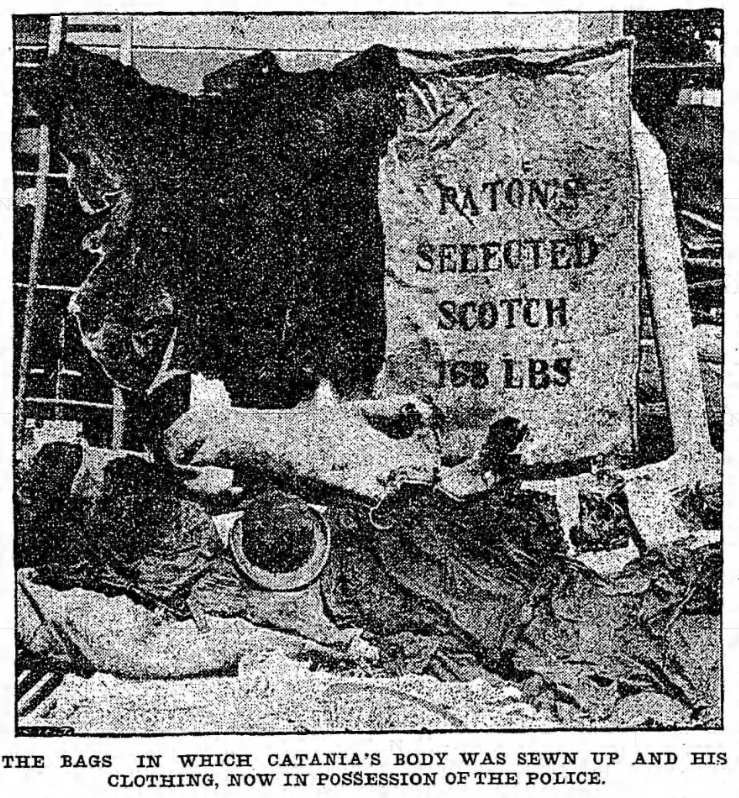 A fence by the roadside was smeared in blood, leading police to believe the sacks with Catania and his clothes had been rolled down from the street, as opposed to carried up from a boat on the water. 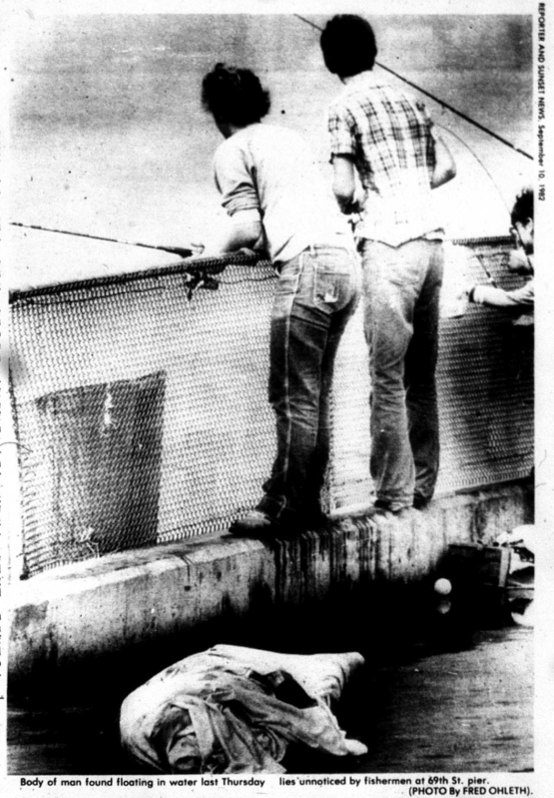 Bodies washed up along the Bay Ridge waterfront quite often, at least as recently as September 1982, when the Home Reporter published a photo of boys fishing off the 69th Street Pier, a body pulled out of the water lying near their feet. 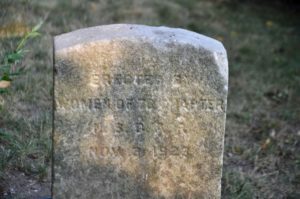 One of the earliest mentions of “Bay Ridge” in the Brooklyn Eagle archives, from July 1854, is an item about the body of an unknown German found on the shore, near the armybase. Stories about such bodies turn up all the time in the archives—though usually not with such gruesome details, especially not back in 1902. The killers had surely been looking to dump the body in a place of relative seclusion, and Shore Road was it—then, it was even more desolate at night than it is today. Most of the parkland and expressway we know were built atop landfill in the first half of the 20th century. 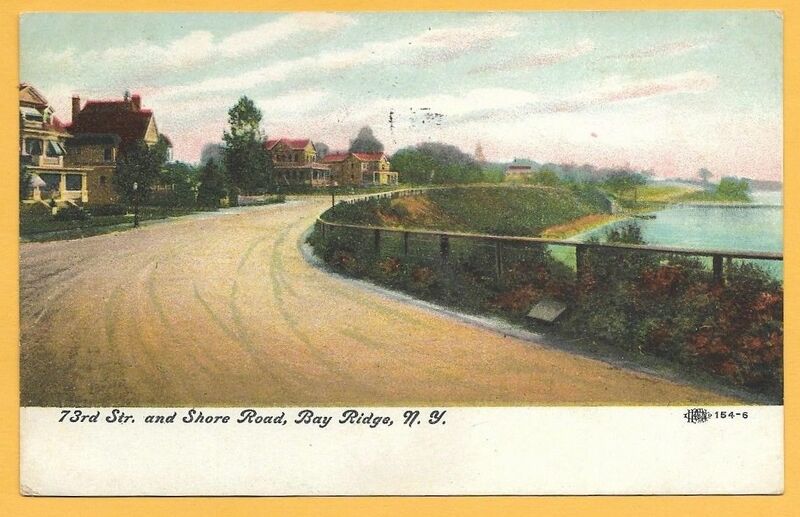 At the turn of the century, Shore Road actually touched the shore on one side; on the other were quiet villas, the mansions and boarding houses of the wealthy, plus a few surviving farmsteads, not packed together too tightly. To the south, by the armybase, there were hotels and attractions on Shore Road, a little rough-and-tumble resort town, a competitor to Coney Island, which was just starting to reach its heyday. 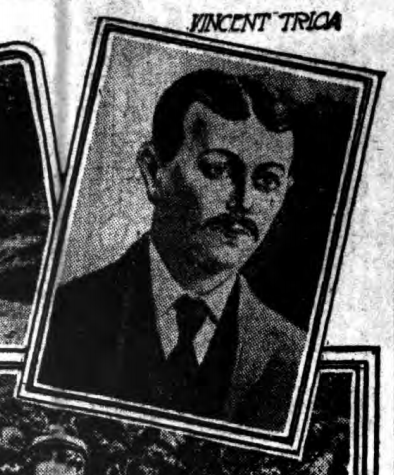 Yet even this southerly stretch could be dangerously deserted; young art student Frederick Hardy had been murdered on or near Shore Road, around 97th Street, just three years earlier, his assassin taking advantage of the pale moonlight to bash Hardy’s skull unseen, stick him in a boat and toss his body overboard off New Jersey. Catania, though, hadn’t even been killed here, just dumped. Police figured his body had been transported by wagon, and all the wagons in the “Italian colony in the neighborhood of Union street” that had been out on Wednesday night were accounted for and examined for signs of blood. But no leads were uncovered. 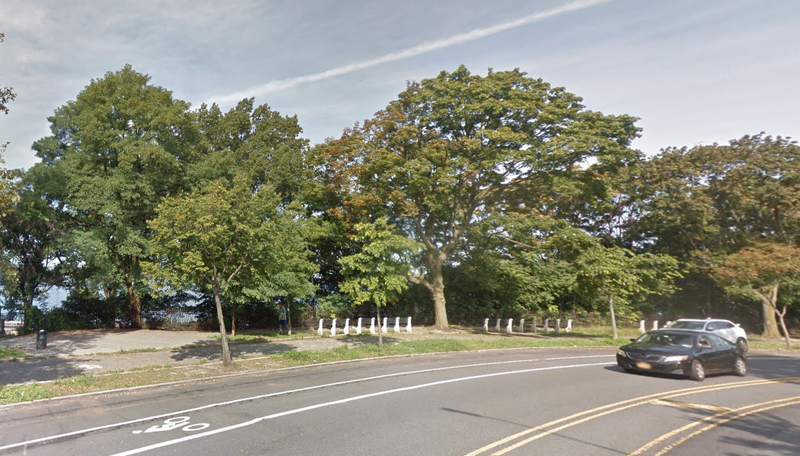 Despite Shore Road’s quiet character, police were incredulous at the lack of witnesses. “It seemed incredible that a wagon with such a ghastly load should be driven in full daylight, as it seems to have been, to a part of the shore road and then that the bundle should be taken from it without notice from some person in the neighborhood,” the Eagle reported. A…strange thing is that there had not been, up to the time of the finding of the body, any person who noticed the wagon or its occupants. There is a house not 100 feet distant from the place where the body was found and yet it would appear that the persons who abandoned the gruesome burden among the underbrush were not interfered with. The people in the immediate neighborhood are jealous of their rights and are particularly careful that the vacant spaces in the immediate vicinity are not used as public dumping grounds or the receptacles of nuisances, yet it seems plain that two or three men were permitted to back up a wagon on this public highway, take a suspicious looking bundle from it and tumble it down the hill without molestation. That is what has been puzzling [the police captain], who, since he has been in charge of the precincts, has had dozens of complaints of much less noticeable infractions. Volunteer lifeguards had been 20 feet away until about 6pm and reported no sack or suspicious crew. The Mackay family, eponyms of Mackay Place who lived just across from the dumping ground, were away all evening. The best police could come up with was a lamplighter, who “saw a light wagon…with two men in it, on the Shore road at the foot of Seventy-third street. He noticed the men jump into the wagon hurriedly and drive off.” This was probably around 7:30pm, not long before the boys would show up for their swim. It is believed that at least three men were required to do the job. 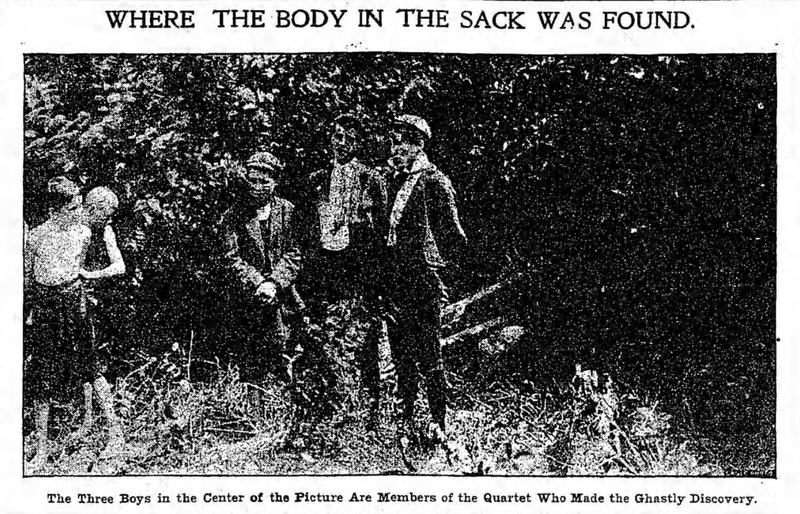 Not less than three could have handled his bulky body [he weighed 225 pounds] after the head was severed from it; not less than three could have sewn the remains in the bag; not less than three could have carried it to the place where it was found. Their best guess as to the owner of that arm was Vincenzo Trica, who lived near Catania and had, reportedly, fought with him on Sunday night. Plus, Trica worked in a stable, from which he could easily have gotten a horse and wagon (though his boss swore no wagons had been taken at the time the body was being moved); he had copies of the Sunday Times in his room, from June 29 and July 20, like the one used to wrap Catania’s head in the sack, though Trica did not read English; and a corner of Trica’s room had recently been scrubbed, floor to ceiling. Still, “Catania must have bled a gallon from the horrible wound in his neck,” the Eagle reported, “and the closest inspection fails to show the slightest sign of blood in Trica’s place.” A red spot on the floor proved to be paint. Four men lived in a room behind Catania’s store “but were not Catania’s friends. They were intimate with Trica.” Trica owed Catania $14 [very roughly, almost $400, adjusted for inflation], for groceries and “Italian condiments” he’d bought on credit from the store; Trica and Catania had been friendly, the Herald reported, but now the former wouldn’t even acknowledge the latter on the street. When Catania showed up to Trica’s home that Sunday, demanding the money for the long-outstanding debt, the men fought, and Trica threw Catania down the narrow staircase that led to his apartment. The men wrestled on the street, in front of the neighboring barbershop, until the barber, Thomas Pace, broke it up. Such racism oozes below the surface of the reporting and investigation. “History has afforded instances of Italian reconciliations leaving an unquenched and tigerish thirst for blood in their wake,” the Sun reported. Detectives turned up at Trica’s place, at 604 Hicks Street, near Summit Street, demolished later for the BQE, at 3am on Thursday, just hours after Catania’s body had been discovered. The Eagle’s reporting is particularly vivid. The house in which he was found is two stories in height and of brick. It is not more than 28 feet deep and there is a store on the ground floor, unoccupied, and the room, or rooms, of Trica above. It was originally one room, but the owner, father-in-law of a former police roundsman [an officer in charge of a patrol], had put in a partition, dividing the room into two little cubby holes of apartments. In the front space the occupant slept and the rear part…was used as a kitchen and toilet room, indescribably filthy and a standing menace to the health of the neighborhood. The approach to these rooms is by a narrow stairway, and right at the head of the stairs is a sink, for the use of the occupant. The dead man weight 225 pounds. Surely his dead body could never have been taken down these stairs in a sack without leaving its marks on the walls and on the door casing. But the police had a notion, from the very isolation of Trica’s dwelling place, that the murder might have been committed there. Using a candle, the party of policemen found their way up the narrow stair. They knocked at the door and could hear the occupant shuffling out of his little cot and across the floor. The door which they waited for him had a panel split in two. This they later learned had been kicked in on Sunday by the peaceful Catania when he went to collect his $14. The policemen were examining this door when it was opened and Trica appeared with a lamp. He was in undershirt and trousers and stood blinking like an owl at the four men who were in the hallway. He was immediately questioned, by a policeman fluent in Italian, about Catania, and Trica said only that he had seen him Monday, owed him money and expected to pay it. Police arrested him. Then the policemen…searched his house, examined his clothing and fully overhauled the premise. Trica made no objection to the invasion of his home or the actions of the police…He stood by unmoved while the officers examined every bit of his wardrobe, which was not very extensive, to find some traces of blood. His shirt, his underwear, his outer garments were all scrutinized; his skin was examined and the officers looked over his finger nails, searching for crusted blood. But there was no trace of bloodstains anywhere. The room itself was closely examined, and every bit of furniture. There was a table in the room, laden with the remnants of a frugal meal, a bit of fish, a box of olives, the stump of a cheap cigarro, a heel of a loaf and a bread knife, very much rusted and stained as to the blade. All these things, with the dull light of the lamp, the policemen examined, and they turned the cot over, scrutinized the flooring and the walls and the ceilings looking for a spatter of blood. The room had been papered not more than a month ago, for Trica moved in only three weeks ago and the place had been renovated in a meager way for the new tenant. The paper on the wall was clean and comparatively spotless and there were certainly no stains there. …There was not the slightest sign of blood anywhere in the rooms. Nor was there any indication of a recent struggle in the place. Certainly…murder had not been done there, such a ghastly murder as this had been, where the scene of it must have been converted into a veritable slaughter house. Police had failed to find the scene of the crime—but had they found the man who had committed it, at least? Trica, 26, was single, and like Catania he had come to America from Palermo. He worked as a fruit sorter across the street from his home, at a livery and boarding stable at 629 Hicks Street. Its owner, Luigi Nosedo, would buy cases of damaged fruit, then have it sorted and repacked to sell across the city. Of his many employees, “Trica seemed to be one of the most industrious,” the Eagle reported. His boss said he worked until 6pm Wednesday night, close to when Catania’s body was believed to have been moved to Shore Road; he had a shave across the street, next door to his home, said Pace, the barber who’d broken up the brawl with Catania days earlier. Nosedo said he saw Trica later on President Street, about 9pm, and that Trica borrowed a quarter from him. 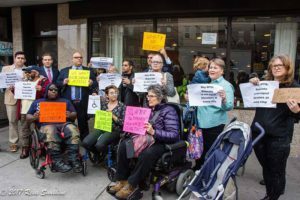 Despite his ostensibly decent character and apparent alibi, police arraigned him Thursday morning at Coney Island court, charging him with “suspicion of homicide.” “The prisoner cannot converse in English fluently,” the Eagle reported, “but…he pleaded not guilty and was committed to Raymond Street jail pending further examination. Soon after his release, Trica returned to Sicily. There is a strong suggestion in this case that some mafiosa accomplished the death in far away Brooklyn of…Catania…The local police are convinced from recent developments that the murder of the grocer was the work of the Mafia, an organization which…permeates every branch of activity throughout Sicily. The members of the Mafia are to be found in every rank of society, although it has no regular organization, no recognized leaders and no fixed code of laws. Its chief principle is that no honest man should ever give any information to the authorities which may lead to the arrest of a criminal. If a man has sustained an injury from another, according to the laws of the Mafia he must do his own justice. If the crime does not affect him he must shield the criminal from the authorities. No offense, according to the mafiosi, is more disgraceful than taking the part of an informer and that, according to local police, is what Catania did and that is why he was so cruelly murdered. Well, not quite, but police were on the right track. Around 5:30am on Tuesday, April 14, 1903, Mrs. Frances Connors was walking to the bakery through drizzling rain. As she traveled down E. 11th Street in Manhattan, east of Avenue D, she passed a barrel on the sidewalk, between two piles of lumber, and in “the gray dawn…noticed a coat hanging over the side of it,” the Eagle reported. It was in front of No. 743, the New York Mallet and Handle Company Works (since torn down for the Jacob Riis Houses). She brought back a policeman to take a closer look. The body was still warm. 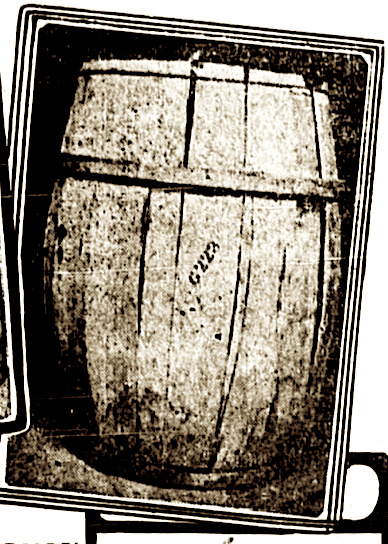 Police quickly connected the murder to Catania’s; the press had dubbed the grocer’s case the Sack Murder, and this new one would become even more infamous—the Barrel Murder of 1903. 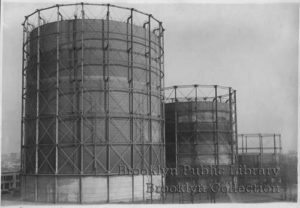 “Police asserted…given the similarity to the Bay Ridge murder, that it looked like the Mafia had come to town,” Mike Wallace writes in Greater Gotham. By the next night, eight Sicilians were in custody, counterfeiters, blackmailers and kidnappers—members of the Mafia—who had been surveilled for more than a year by the United States Secret Service (which in addition to protecting the nation’s leaders also protects the integrity of its financial systems). 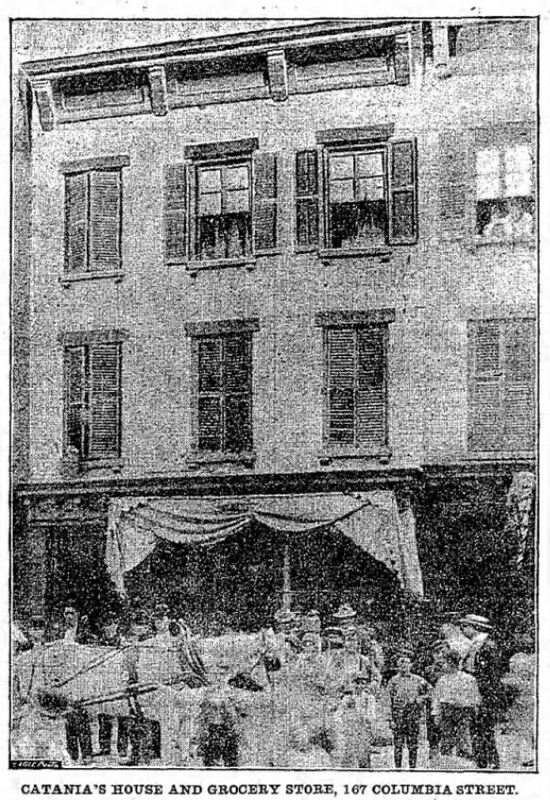 Police believed the Barrel victim—identified later as Benedetto Madonia, a recent Sicilian immigrant—had been killed at 226 Elizabeth Street, “a low, ramshackle two-story building” with a pastry café on the ground floor: another barrel just like the one he’d been stuffed in was found there, as well as sawdust resembling that which had been in the barrel (which had been so stained with blood it was compared to mahogany shavings). Giuseppe Morello lived at that address. He’d been born in Corleone, Sicily, and moved to the U.S. around 1893, probably with false papers, likely to escape a conviction for murdering a police official there for the Mafia. The leader of the gang, Morello was arrested first, around 8:15pm, walking on the Bowery, near Delancey Street. The rest were arrested at different points on the same street, all within 15 minutes, so quickly and unexpectedly that the Sicilians were unable to resist, despite each one’s possession of various weapons. Catania had been in with this gang, perhaps passing their counterfeit currency through his shop. “Catania became addicted to the excessive use of liquor,” the Times reported (though the Eagle had reported the opposite), “and when under its influence he was wont to talk too freely of the affairs of [Morello’s gang]. Therefore it was supposed by the [Secret Service] agents that the others had [done] away with him in order to protect themselves”—though the agents did not have proof of this. 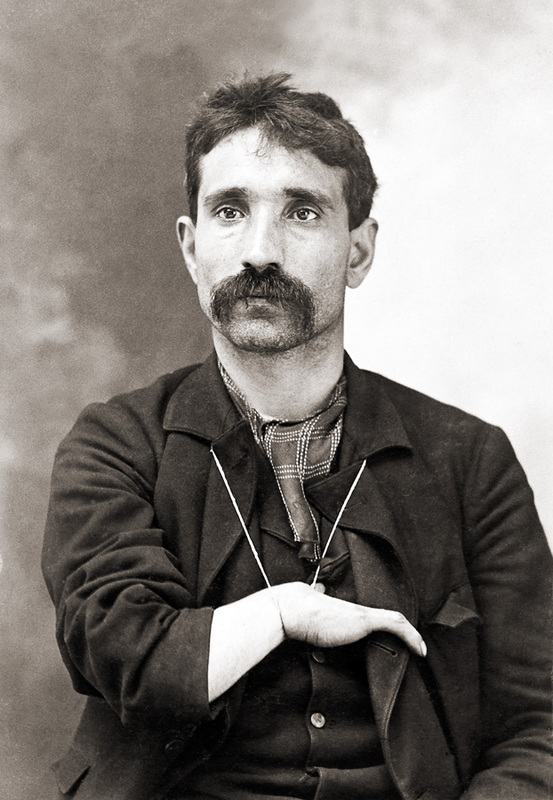 Catania may not have been the first man murdered in America by a Sicilian-immigrant crime syndicate, but he was the first high-profile victim in New York City. 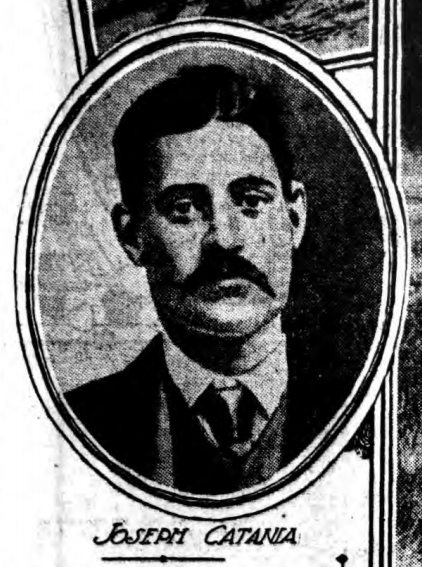 “The Mafia…[was] secretly blackmailing wealthy residents of the growing Latin colonies in this country, and occasionally there was a murder,” the Cincinnati Enquirer explained in 1911. “These, however, escaped more than casual mention in the papers. “It was in the fall of 1902 that the carnival of crime among the Italians broke out in real earnest, and since that time murders, robberies, bomb explosions and instances of incendiarism there have been. 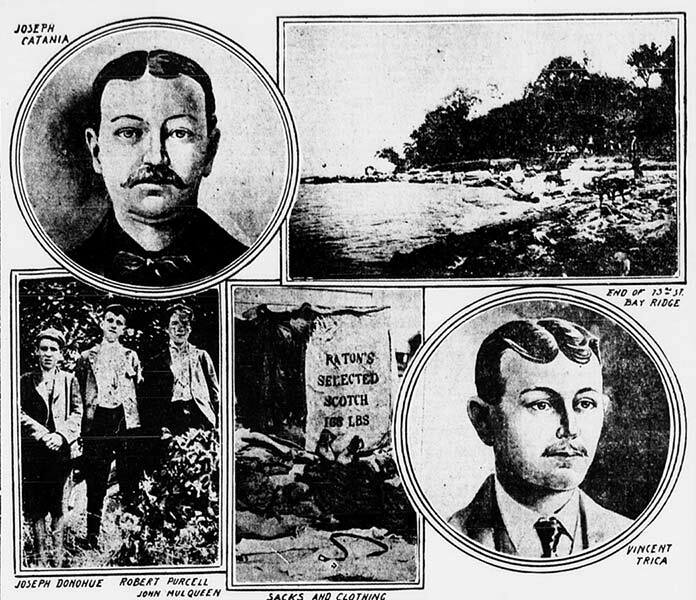 The murder of Giuseppe Cantania, a grocer in the Red Hook section of Brooklyn…was the first of the series of crimes that has continued with increasing force”—and raged for much of the 20th century, with its roots in a sack on the Bay Ridge shore.